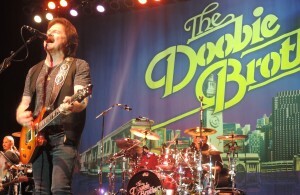 Guitarist and lead singer Tom Johnston of the Doobie Brothers rocks the encore on Nov. 4 at the Sands Casino in Bethlehem, Pennsylvania. A weekend of rock and roll ended with me doing something I don’t normally do — rushing the stage for the band’s encore. Of all the concerts I’ve seen, I don’t ever recall rushing the stage. I think that’s because I normally don’t sit close enough to the stage for most shows. I once sat in the front row for an oldies show and there was no place to rush to. I was already there. Mostly, though, I sit in the cheap seats, the ones so far away from the stage you’d need to hail a cab to get up front. The other aspect is at this age, I don’t “rush” to go anywhere. I usually mosey, lumber, meander or traipse, with an occasional dilly-dally thrown in, and when I’m really motivated, a lollygag or two. The music weekend kicked off Nov. 2 with a show by The Hooters, a Philly band that had some commercial success in the mid-1980s with the singles “All You Zombies,” “Day by Day,” “And We Danced” and “Where Do the Children Go.” Since I’m a Midwestern transplant to Philly, I didn’t grow up with these guys and was unfamiliar with the band’s catalog of music. But they’re big here in Philly and I had not seen them live. The Blonde Accountant, a big Hooters fan, planned the entire evening, complete with a pre-concert pizza party along with several other friends and Hooters fans. 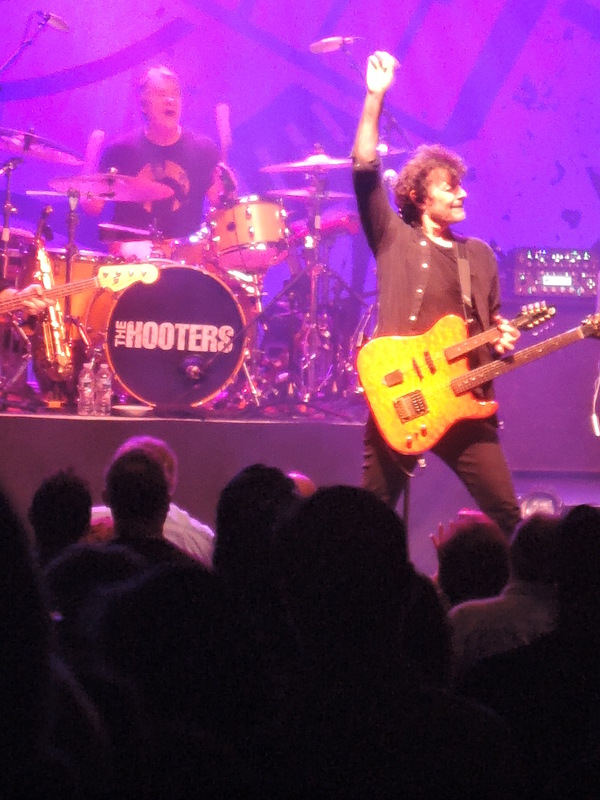 Guitarist Eric Bazilian and drummer David Uosikkinen of The Hooters rocked out Nov. 2 at the Keswick Theater in Glenside, Pennsylvania. Our seats were stage left, about two-thirds of the way back, in a packed venue. The band was excellent, but there was no way I was going to rush the stage that evening. That’s because it was a “Hey You Kids Get Off My Lawn!” night for me. The fact that we were too far away from the stage for me to rush it was irrelevant because it was one of those shows where we stood and danced for much of it. While my head and heart are perfectly happy doing that, the dancing offends my knees and hips quite a bit and they don’t hesitate to bark at me about it. In addition, the temperature inside the venue was hot enough to cook a turkey. Rather than thinking about rushing the stage, all the standing, dancing and sweating had me considering calling an ambulance. The second concert of the weekend was a much different story. The Doobie Brothers were in Bethlehem, Pennsylvania, on Nov. 4 and I usually find a way to see those guys when they’re in the neighborhood. Here’s the thing, though: I’m more of a Tom Johnston early Doobies fan while my wife is more of a Michael McDonald later Doobies fan. 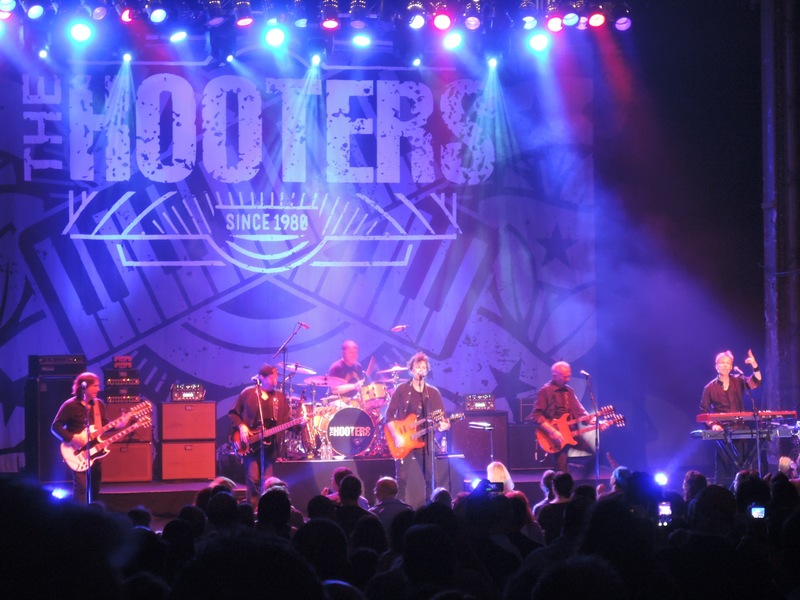 I like both versions of the band, but McDonald has been a solo act for a long time now and Johnston, a co-founder of the Doobies and lead singer and lead guitarist on a lot of their early songs, is one of the originals. So, I only needed one ticket for the show, and when you need only one ticket, you can get a pretty good seat. Which I did: Stage right, second row, right on the end. Face value on the ticket, under $100. To me, that’s a pretty good deal to be that close to the band. And my route to the stage was easy. One step into the aisle, then about seven feet to the stage. 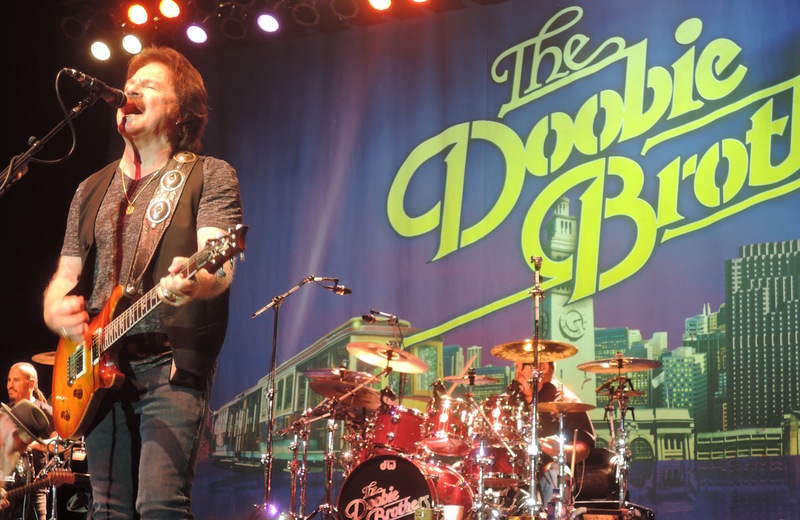 In addition, the Doobies attracted a little older crowd — who can still rock, by the way — but preferred to mostly stay in their seats for much of the concert. So not only were my knees and hips happy with that, I had only a short mosey to the stage if the opportunity presented itself. Doobies guitarist and lead singer Pat Simmons performs “Busted Down Around O’Connelly Corners” from the 1973 “The Captain and Me” album. The Doobies actually had a special show for us. They had earlier announced that they would be doing their first-ever full-album performances at the Beacon Theatre in New York. They’re going to perform “Toulouse Street,” their second album from 1972, on Nov. 15. And then the next night, they’re going to perform “The Captain and Me,” their third album from 1973, on Nov. 16. Before he joined the Doobie Brothers, Simmons hung out in southern California perfecting his craft. 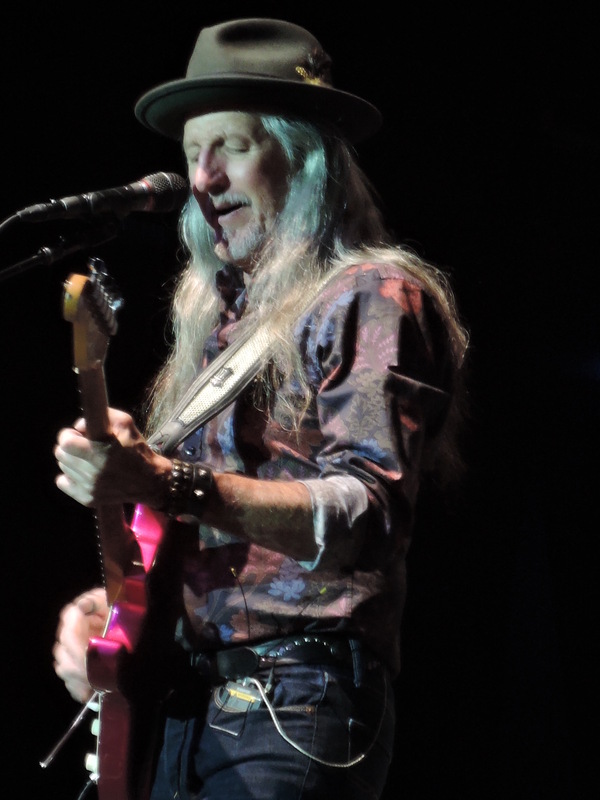 After playing club gigs, Simmons and his friends would oftentimes head over to another friend, Mike O’Connelly’s place, in an apartment building on Main Street in Los Gatos, California, to relax, play their guitars and sing. “We’d sit around and somebody would play a song and the rest of us would sing along. It was kind of like a poor man’s Bluebird Cafe,” said Simmons, referring to the famous club in Nashville, Tennessee, that attracts singers and songwriters to its intimate setting. And that was the inspiration for the song “Busted Down Around O’Connelly Corners,” written by James Earl Luft. By the time the Doobies were recording “The Captain and Me,” the record’s producer, Ted Templeman, had become a big fan of Simmons’ traditional ragtime guitar picking. We got to hear the entire song at the Bethlehem show. It’s not one I’ve ever heard them play live in other shows I’ve seen over the years. And it was the first time I’d heard more than the 48-second version of the song that appears on the album. Among the deep cuts the band performed during the 19-song show included “Mamaloi” and “Cotton Mouth” from the “Toulouse Street” album; and “Clear as the Driven Snow,” “Without You,” “Evil Woman” and “Ukiah” from “The Captain and Me” album. Very cool. My knees and hips were happy to accommodate me for two songs without much complaining about my dancing, and I was able to multi-task on a few photos and a little video while rocking with the Doobies. You gotta dance like nobody’s watching when you get the chance to be down at the stage to listen to the music. 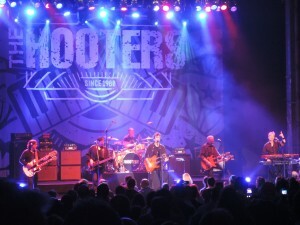 Philly’s own The Hooters performed for three hours for the home crowd Nov. 2 in suburban Philadelphia.